As March comes to a close and Spring begins, it’s a good time to take a look at your progress toward your 2018 goals. If you need a little inspiration, look no further for than Chemtek’s own Randal Schow, an employee of eight years. Randal has generously shared his story of overcoming the toughest battle of his life – melanoma. His story gives us new perspective on setting goals and sticking with them through life’s most challenging obstacles. Randal is a member of Chemtek’s Airfield Maintenance Services team. One October evening in 2012 while chatting with other members of his team, he decided to pursue his goal of earning a Bachelor’s degree in project management. Shortly after, he enrolled in online classes at Colorado Technical University (CTU) while continuing to work for Chemtek. 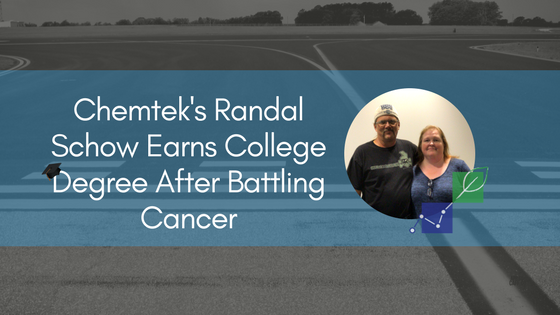 One year later in October 2012, Randal was diagnosed with stage 2 melanoma. He received treatment while continuing to chip away at his degree. However, his physical condition took a turn for the worse in the spring of 2014. His stage 2 cancer which had been in remission returned as stage 4 melanoma that had metastasized to his abdominal cavity and back. He underwent multiple surgeries at Duke Hospital, including having two rods and eight screws put into his back where the cancer had been attacking his vertebrae. He began a newly discovered cancer treatment which was a form of gene therapy. This treatment allowed his immune system to attack the cancer like a virus – and it worked. While Randal still has regular appointments to monitor the little bit of cancer that remains, he is doing well and as of October 2017, is a proud college graduate! Standing firm in his goals was essential to Randal’s success. To other adults considering returning to school, he says that the struggle is worth it. It may not seem like it in the moment with many challenges to overcome, but down the road the commitment pays off. He takes pride in the improvement of the quality of his work and looks forward to future professional growth. We can all take time to remember how important our family and friends are, especially as think about our own lives and dreams for the future. Randal’s story is an inspiration to many, demonstrating the true value of hard work in the face of adversity.